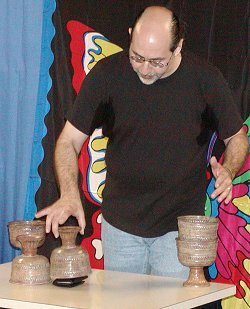 Since 1976, Rick has been dedicated to the genres of magic termed Haunted Magick and mentalism. He doesn't do tricks, he doesn't do a lecture of tricks. He does a lesson in performance and his use of mentalism seemed to be more of a medium by which he conveyed the very important lessons of how to perform, how to direct an audiences attention, how to have confidence in your presentation and  although unsaid  how to perform in a way that gives you pleasure as well as astounds your audience. Mr. Maue's background was in corporate sales for over twenty years and the well-organized lecture exhibits the undeniable fingerprints of an author trained in conveying a message that sells. As he points out, selling is not a bad thing. In fact, it is what we as magicians or mentalists should be doing. In a slight variation of Robert Houdin's aphorism, we are salespeople selling magic as magicians. Magic, Mr. Maue points out, should be personal. You need to leave your audience knowing something about you so that they cannot only re-book you but also so they care about what they are seeing. 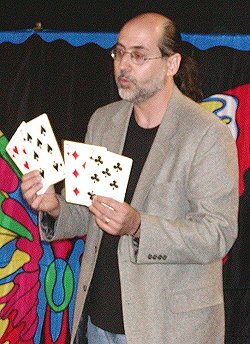 We are not performing tricks off the shelf in the same manner as any other magician with sufficient cash reserves; we are truly trying to make an impression on our audience that they are seeing magic, not a magician. The effects Mr. Maue presents are original and fresh. If you attend his lecture, and I recommend you do, you must stay for the second half where he does an incredible card in wallet/card in pocket routine. I watched very carefully and was blown away. It is a gutsy and new approach to something we have all done and yet never really knew why. The effect is as it should be. You tell your audience that you previously selected a card and placed it in your wallet. You then ask the audience member to think of any card in the deck, find it and return it to the deck. Within seconds, you remove the card from your wallet and find the exact same card within the spectators deck  they match. with a borrowed deck. The effect is devastating. Loyal readers of Inside Magic know that I have the talent of a bug with the shakes. But even I could do the new version Mr. Maue provides. Criticism of Mr. Maue could only be that he has few tricks interspersed among much talk. But that criticism is muted by his whole reason for the lecture. He is trying to use the lecture to teach how perform, to think, and to work with an audience. Praise for Mr. Maue is his ability to convey his message, his originality, and his willingness to share effects that he could clearly market in some other manner. It is clear that Mr. Maue cares more about conveying to his audience his central message than making money off the tricks or books he has to offer. In fact, of all the lectures I have attended, this was the least commercial lecture ever. It is kind of sad to think that Mr. Maue's approach to lecturing would be unique, but it is. He cares about his audience, his art, and conveying his art to his audience. Were lucky to have him in our art. Thanks to Tim Quinlan for taking pictures while I took notes and flirted.